Please Note: The information contained below is not meant as a substitute for seeking professional help if you have an animal who is sick, injured or you think may be unwell. 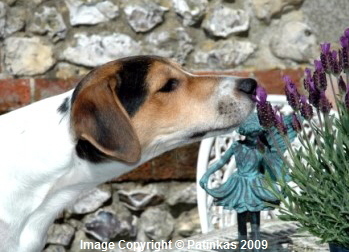 Always seek help and advice from a qualified veterinary surgeon in the first instance. Animals, in common with all other living beings, have a chakra system. This system is a complex network of spinning, energy vortices (often called 'petals' in Eastern traditions) which run throughout the entire body. Universal energy (Prana, Chi, Ki) flows in and out of the chakras, along the meridian system, into the aura and then finally into the physical body. The energy flows two ways; inward and out. Therefore, every thought, act and emotion affects the chakras and is mirrored in the aura. Likewise, external stimuli, both positive and negative, have an effect on the chakras and leave their mark in the aura (including physical injuries). This is the same for animals and humans alike. For those unfamiliar with the chakra system, if you imagine the subtle energy body (made up of chakras, linked to meridians and contained in the aura) as being like a car engine, and the physical body is the actual vehicle which the engine drives, it is not difficult to see that when the car starts to perform less effectively or even breaks down, that it's the engine which needs repairing or re-tuning and not the car bodywork. It's the same with the subtle energy body. When we re-charge/realign the chakras - get them spinning in harmony and at the correct rate - you get the physical body running smoothly once again. Animals have 8 Major chakras, 21 Minor chakras and 6 Bud chakras. Alongside the seven Major chakras that animals share with humans (Crown, Third Eye, Throat, Heart, Solar Plexus, Sacral and Root), there is another Major chakra which is unique to animals. It is called the Brachial or Key chakra. This chakra was discovered by the world's foremost, internationally renowned, animal healer, Margrit Coates (click here to visit Margrit's web site, The Animal Healer). 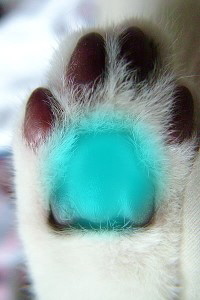 The Bud chakras are found one on each foot (pad, paw, hoof, etc) and one on the skin at the base opening of each ear (see right). They are especially receptive to subtle energy vibrations; for example changes in the weather like a thunderstorm, or even impending, major earth events like an earthquake or hurricane. The Bud chakras located in the feet are often used to source areas of energy in the ground which are beneficial to the animal. When they find these areas they may paw the ground before either laying or rolling on the spot (not to be confused with a dog finding something 'smelly' to roll in!). Standing on such an area can also help ground an animal. Unsurprisingly, most animals' senses or instincts are far more finely tuned and sensitive than humans' (although some animals are more developed than others, like dolphins). 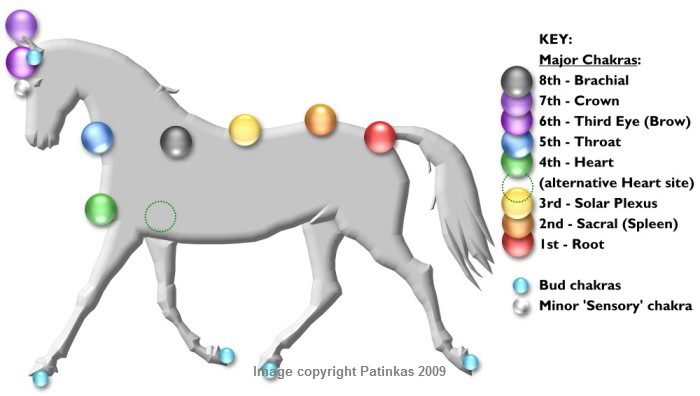 As a result, animal chakras are usually far brighter and larger in comparison to ours. Their strong sixth sense emanates from the primary sensory centre; one of the 21 Minor chakras. This is located at the bridge of the nose, below the Third Eye or Brow chakra. 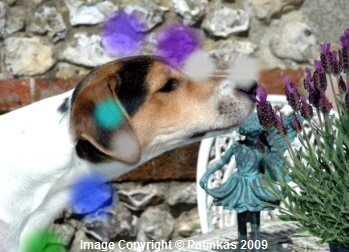 Animals are constantly absorbing and computing sensory information; far more so than humans owing to their reliance on instinct for survival. Aside from using the Bud chakras in their feet as mentioned above, they may also be seen rubbing a part of their body against a tree, rolling on the ground or even rubbing up against their fellow animal or human companions to stimulate a chakra. An animal who has suffered from physical, mental or emotional trauma, however, may not always be able to repair the resulting energetic imbalance and this is where we find signs of disease (dis-ease) present. Each chakra corresponds to an aspect of the self; thought, emotion, senses, instinct and so on. Whilst governing the same physical areas, animal chakras have, however, developed or evolved slightly differently from humans'. This can be further defined with differences between domestic and wild animals. For example, you tend to find a more developed Heart chakra in wild animals (strong herd hierarchy) plus a more pronounced Root Chakra (stronger sense of survival). With a wild horse you will see a stronger flight response (Solar Plexus chakra) than in a Thoroughbred, which is a man-made breed. 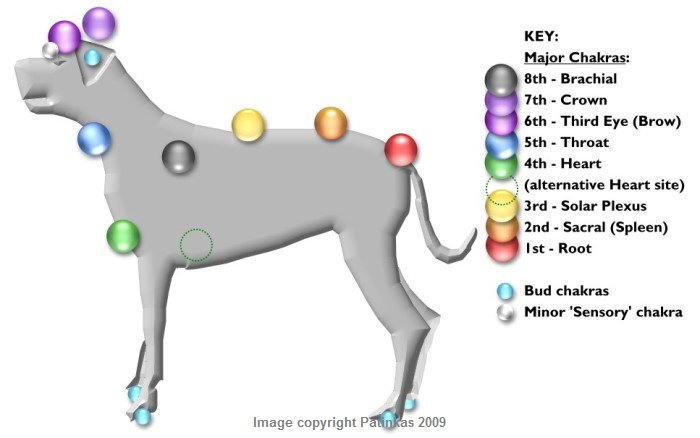 Then we have neutering or castration of domestic animals; which strongly affects the Sacral (or Spleen) chakra. Function: govern the sensory systems. The most important Minor chakra is located at the bridge of the nose, below the eyes (under the Brow or Third Eye chakra - see diagrams). 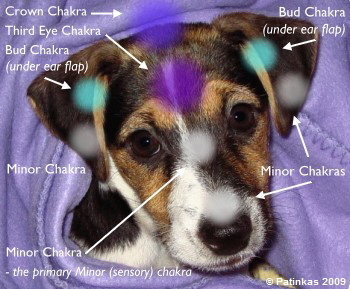 Above Left: Dog's Minor 'sensory' chakras in action!